Sheetla Ashtami comes 6 days after the Holi festival but many people observe the Sheetla Ashtami on the first Monday or Thursday after Holi. Sheetala ashtami is on Friday, March 09 in the year 2018. Sitala devi is considered as one of the avataars of Goddess Parvati. 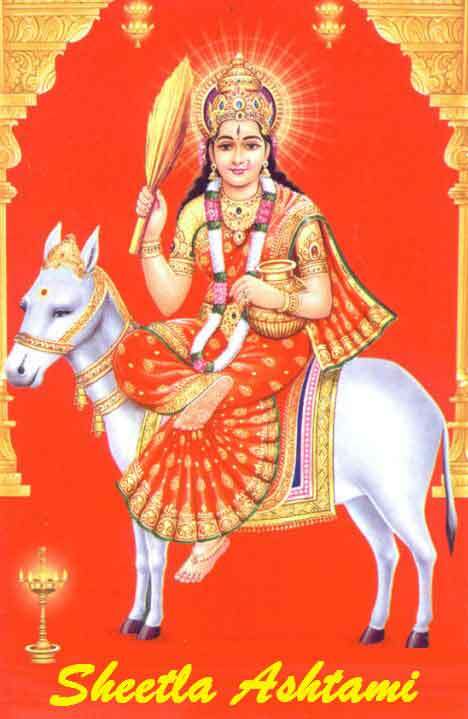 Goddess Sheetala is seated on a donkey and holds neem leaves, broom, soup and a pot. Skanda Purana explains the worshipping of Sheetala Mata. Skanda Purana also mentions about Sheetala Mata Stotra which was written by Lord Shiva and that is also known as ‘Sheetalashtak’. Some Mothers obey Shitala fast or Vrat for the good health and prosperity of their children.Sheetala Mata wears a red-colored dress, rides a donkey. 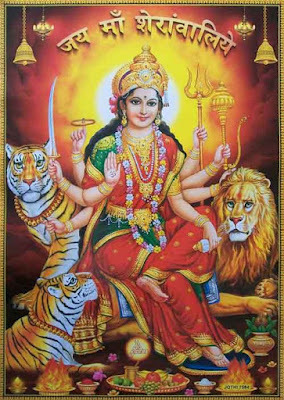 She has 4 hands which hols a silver broom, small bowl, winnow fan, and river Ganga's jal or water.Famous shrines - Sheetla Mata Mandir in Delhi and Gurgaon, Sheetala Mata temple at Dhanop in Rajasthan are some of the shrines dedicated to Sheetla Mata, to name a few. Shitla Ashtmi is one of the famous festivals of Hindus, also known by the name of Basoda. The food is prepared the previous evening and not taken hot or with any hot items as it had to be 'Sheetal' or 'thanda khana', (the food that is not hot). Sheetla mata's name itself means 'nirmal', or 'cool'. After offering Sheetla Mata, the food or roti that has been made a day before is eaten with cold items like Dahi or curd as a prasad. Hot items are not eaten on this day and water is poured on the idol of Sheetla Mata. People also give food to the hungry and needy persons.House is cleaned on this day. Celebrated mostly in North India in states like Punjab, Himachal Pradesh, Haryana, Uttaranchal, Gujarat, Uttar Pradesh, Delhi, Rajasthan and in some parts of Bihar. Shitla Ashtmi is also celebrated in Nepal.A Sheetla mela or fair is organised every year in the months of march-April (month of Chaitra, Krishna Paksh according to Hindu calendar) for Shitla Ashtami in the village of Seel-Ki-Doongri in Chaksu at Jaipur. The shrine of Sheetla Mata is on the top of this hill Doongri. A fair is also held in Kaga in Jodhpur.Religious music is played and Food, utensils, shoes, clothes and agricultural items are put up on sale in this fair. Also organised is the cattle fair. Significance/Importance of Sheetala Ashtami: Sheetla Mata is well known as the goddess who cures chicken pox. It is believed that Shitala Mata will save from the epidemics. People worship her and make offerings.As per Puranas,Hindu's religious scriptures Sheetla Mata was created by Brahma who promised her that she should carry the seeds of lentils along and will be worshiped on earth. Jvara Asura or the fever demon born from the sweat of Lord Shiva, was made as her companion. They came to Earth in the rule of King Birat. The king agreed to worship her but said that she will not be treated as the same as Lord Shiva. Upon listening, she got angry the result was small pox in the kingdom. After this, the king promised her that people of earth will worship her on this day of Sheetla Ashtami. People who worship her do not catch epidemic diseases and live a long and healthy life. Dedicated to the worship of Goddess Sheetala, it is believed that Sheetala Mata controls chickenpox, measles, small pox and related diseases. If you worship the Sheetala Goddess on the day of Sheetla Ashtami, this will prevent the outbreak of epidemic diseases in the family, particularly among children. Sheetla Mata Katha in Hindi is also available. If you are looking for Sheetla Ashtami dates, look below for various years.